HDMI Licensing, the licensing agent responsible for administering the licensing of the HDMI specification, recently announced the release of HDMI Alternate Mode (Alt Mode) for USB Type-C. Developed by the HDMI Founder, the new specification allows cable manufacturers to create HDMI cables that terminate in a USB Type-C port. 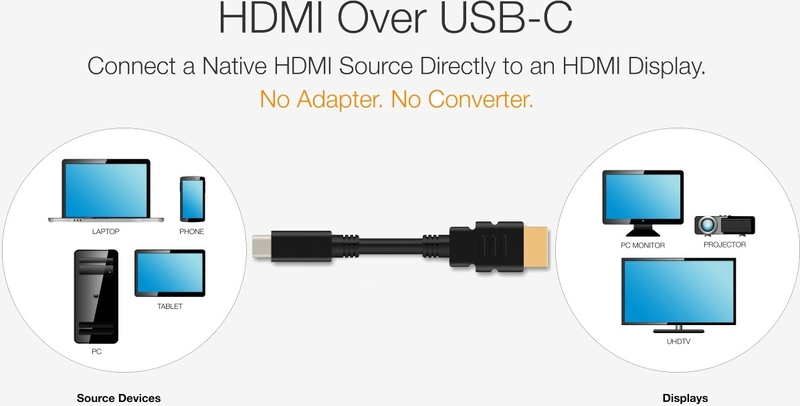 The HDMI cable will utilize the USB Type-C connector on the source side and any HDMI connector on the display side. This means you’ll be able to connect things like PCs, tablets, smartphones and laptops to TVs, PC monitors and projectors with a single cable, eliminating the need for clunky adapters or dongles. Jeff Ravencraft, USB Implementers Forum President and COO, said being able to easily connect devices with USB Type-C to the huge installed base of HDMI-enabled TVs is a substantial benefit to consumers. The executive added that they’re also coordinating with HDMI Licensing to ensure consumers can recognize when HDMI Alt Mode is supported on USB Type-C devices. HDMI Alt Mode will support the full range of HDMI 1.4b features including 4K resolutions, Audio Return Channel (ARC), 3D, HDMI Ethernet Channel and Consumer Electronic Control (CEC). Because it doesn’t support the newer HDMI 2.0b specification, however, the solution won’t offer amenities like HDR video transmission. The specification is already available to licensees meaning we should see supporting hardware hit the market in the not-too-distant future.